Could Fees Ruin Your Retirement? Earlier this year, Frontline ran a special on retirement and the fees that many investors end up paying on their retirement investments. One of the points of focus was the fact that fees charged by retirement accounts can be large — and result in a reduction in your real returns. However, it’s worse than you might think. In some cases, retirees might end up with $155,000 less over time as a result of retirement fees. Could fees ruin your retirement? 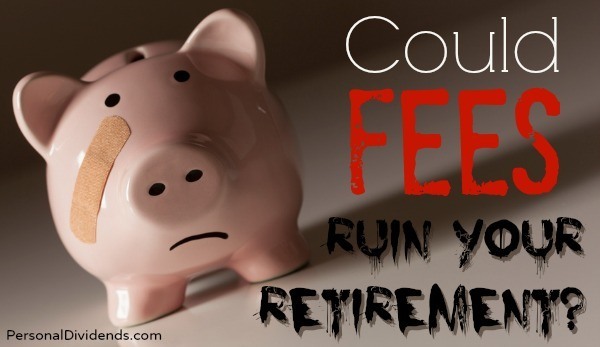 One of the biggest problems with retirement account fees is that they reduce your real returns. When you are paying fees, that amount is basically deducted from your account. This means that not only do your fees offset some of your returns directly, but they also erode your real returns when it comes to your opportunity cost. If the money is taken out of your account in the form of fees, it is no longer working to your benefit and earning you compound interest. As a result, you lose out on what might have been if you had lower fees. Of course, you always have to pay fees. No matter the investment or the account, there are expenses associated with investing. The key is to avoid paying more in fees that you have to. Look for a low-cost plan: First of all, find out what fees come with your plan. Many administrators charge various fees. However, some administrators charge more than others. Your 401(k) statement has to disclose all those fees, so look to see what items are being charged to your account. You might be able to ask your employer to find another plan that has a lower cost. You can also move your money to an IRA if you are unhappy. Get the match (if you have one) and see if you are eligible to move your money. Ask for low-cost funds: Most investors hold funds in their retirement accounts. However, some of the funds themselves are expensive. Try to avoid these expensive funds and instead look for funds that have lower costs associated with them. You’ll pay less, and your money will do more on your behalf. Too many Americans aren’t even aware of how much they are spending in fees, since the fees are automatically deducted from retirement accounts. However, you can find out; it’s easier than ever to read about the fees you are paying. Once you know how much you are paying, you can find out if there’s a way to reduce your fees. There’s no need to pay excessive fees for your retirement portfolio. There are plans that use ETFs and index funds, and therefore are easier to administer. Additionally, these assets are low-cost of themselves. If you are unhappy with your retirement plan options, talk to your employer, and encourage your employer to see if it’s possible to change things up a little bit in order to help you keep more of your money for retirement. The PBS program that continues to pay dividends around the net. Great post! Also on the 401(k) side, as consumers become more knowledgeable about their own plans, one thing I’ve found to help is to take a look at the service from Brightscope. Brightscope was built to add transparency to not only plan fees, but also performance. So this would allow a person at one company to compare their fees and performance to another company down the road or another company in the same industry. Information is power especially when it comes to learning how funds and fees work. Great advice about asking for low cost funds. Our pension fund offers a specific index model option with low fees. Over time, this is the best option to prevent erosion of capital through fees.